Here's a really common scenario. Your boss sent you a message containing all the important things he 'd like you to mention in the meeting. But for some unknown reason, you accidentally delete the message on your new iPhone X or you lost the messages after you updating to iOS 12. Now you have no way of knowing what he wants. There is only one course of action; do your best to get the message back. Luckily you have an iCloud or iTunes backup that contains the missing message. In this case you can simply restore the device. But the problem with iTunes and iCloud restore is that you are unable to restore just messages to your device. You have to restore the entire device which can take quite a long time and can replace all the current data on your iPhone X. We have a solution that can help you restore only messages from iTunes or iCloud backup and it's not at all complicated. Read on to find out what it is. The major disadvantage of restoring data from an iTunes or iCloud backup is that you are unable to partially restore data. You can't choose to restore one type of data over another. 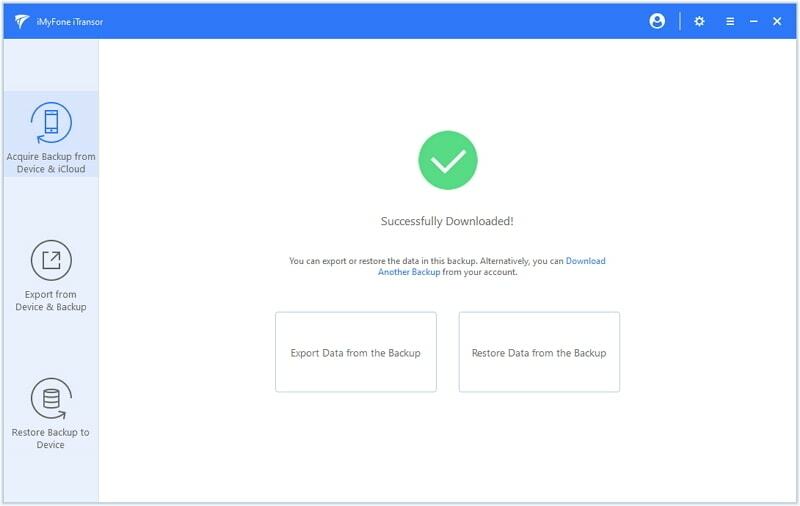 iMyFone iTransor, as an iOS data backup and restore solution, is designed to make the process of backup and restoration quick and easy. The following are some features that make that possible. 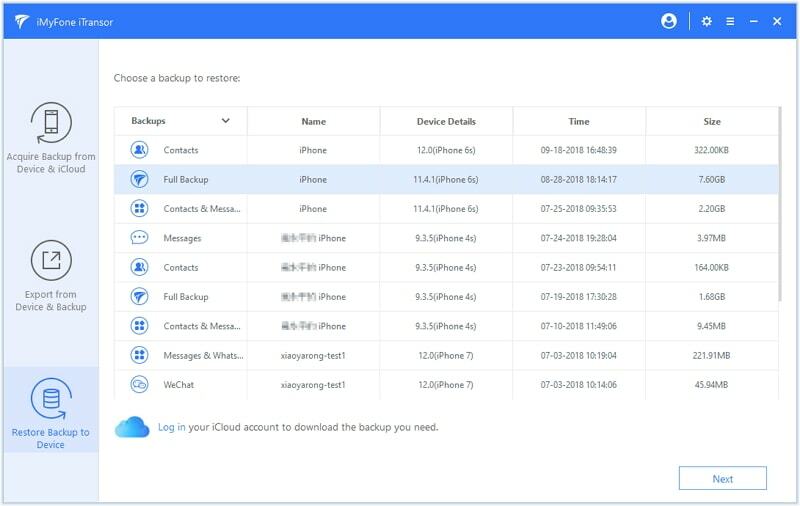 It allows users to restore just Contacts, WeChat, WhatsApp data and Messages, excluding all types of data from iTunes/iCloud/iMyFone backup without affecting other types of data on the device. 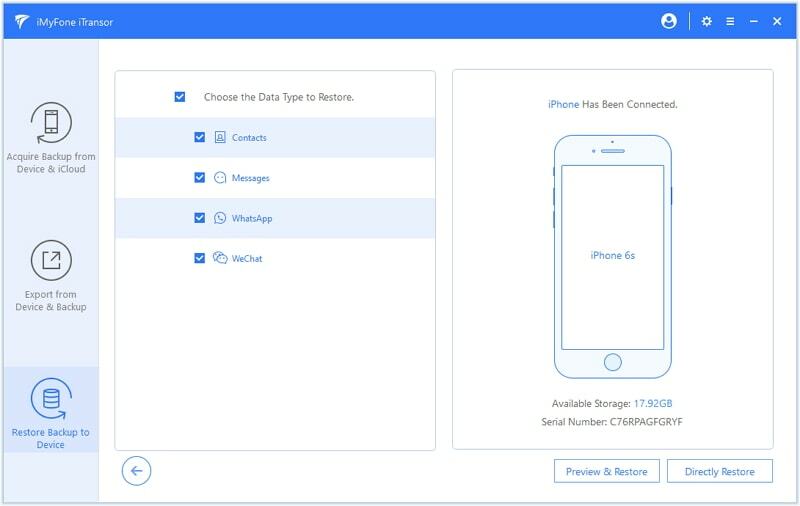 It also allows users to back up only Contacts,WeChat, WhatsApp and Messages instead of all the data and settings on your iPhone. It can merge the data in your backup files with the current data on your device when restoring. All iOS devices and iOS versions including iOS 12 are supported. Step 1 – Start with downloading and installing iMyFone iTransor on your PC. Launch it and choose the 'Restore Backup to Device' tab. From the list of backups that is now on your screen, choose the needed iTunes backup file. Click on 'Next'. 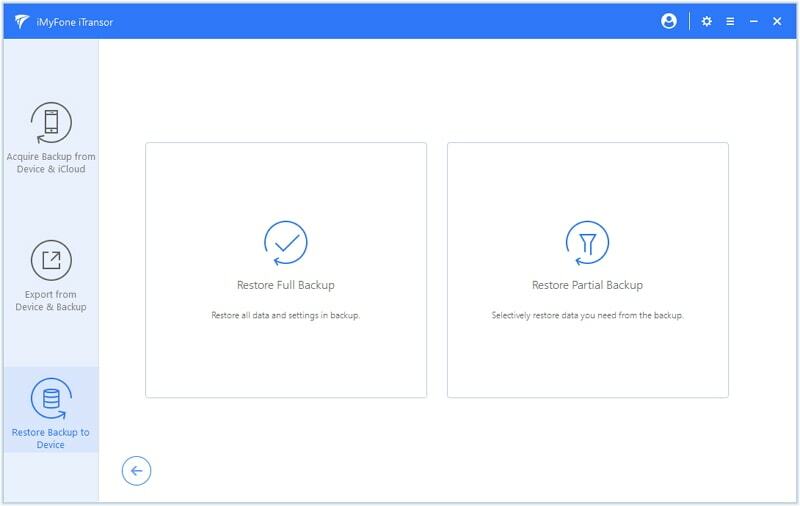 Step 2 – Now, click on 'Restore Partial Backup' from the 2 options offered on screen. 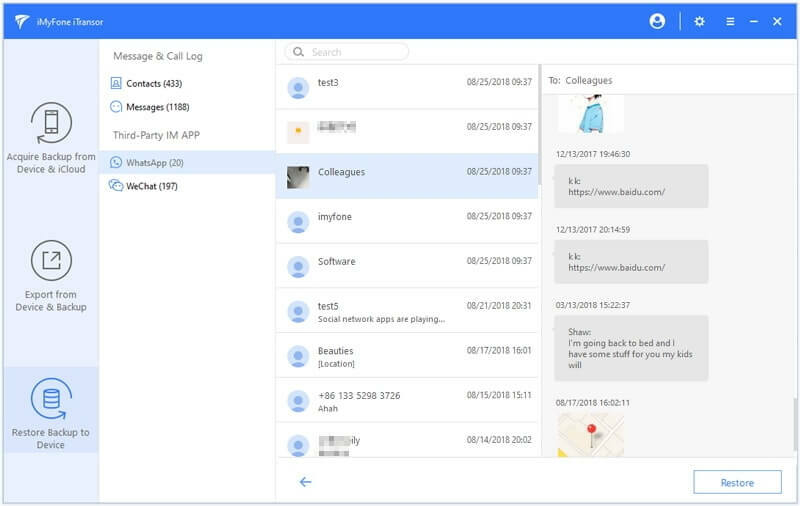 Step 3 – Move ahead with select the 'Messages' from the list that is appearing on the screen. Also, keep ensure to connect the iPhone X properly. You will be able to see the two options at the bottom right corner namely 'Preview & Restore' and 'Directly Restore'. When you will choose the former option, you will get the chance to preview your data before restoring. And if you want to choose the other option, you will not be able to preview your data. Step 4 – After making choice from the two options, you need to again make a decision between the options which are 'Merge & Replace' and 'Fully Replace'. 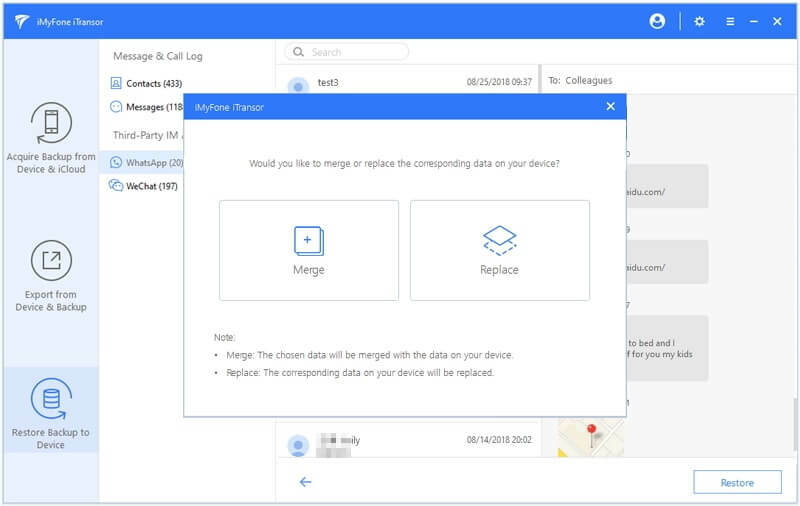 The names are simply suggesting that the first option will merge the data in backup files and the existing data on your device. The other option will result in full replacement of your existing data with the backup. After you choose an option, the restoring process will start and be finished soon. Step 1 – Begin with launching the program on your PC and choosing 'Acquire Backup from Device & iCloud' option. When this gets done, click on 'Download iCloud Backup' and move further with logging in to your iCloud account. 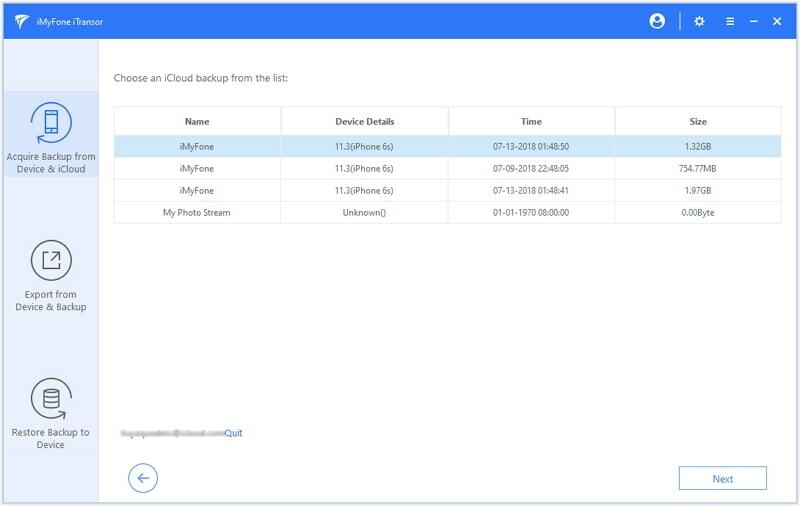 Step 2 – When you login successfully, you will find the backups listed on the screen. Choose the one that has your messages stored and click the 'Next' button. Wait for the backup to be downloaded and once it is completed, start restoring it to your iPhone X. The steps for restoring your messages are same as that of iTunes. You just need to choose iCloud backup file instead of iTunes at the first step. All you need to follow the steps like you did in the above guide. 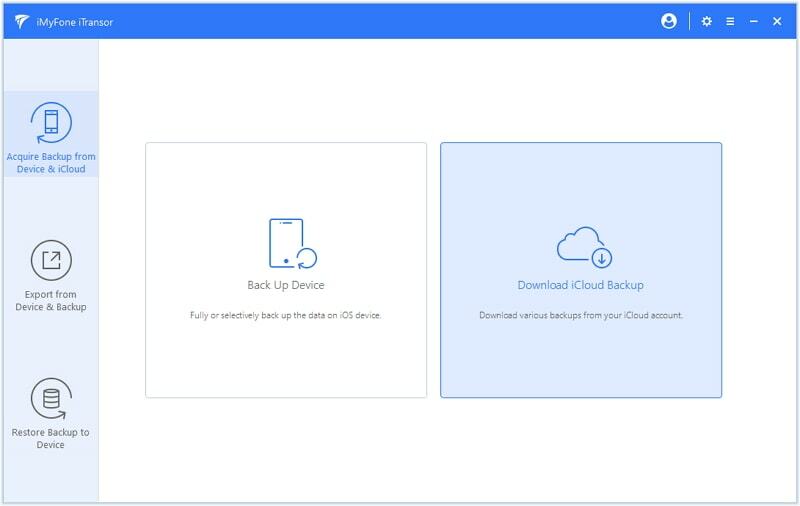 The iCloud backup made for the devices running iOS 12 are also supported.